As suggested by the Sydney Fish Market’s seafood school’s brochure, such delicacies from the sea can take “your weekend barbie from casual to gourmet.” Our latest news from the Land of Oz includes a brief update as several of our traveling Hales Study Group members left our hotel early Thursday a.m. for the Sydney Seafood Fish Market. We were oriented to the “floor” by our guide Branden, who was soon explaining the distribution of different species and seafood types of that morning’s haul including first, the largest delights that were caught by fish lines including massive tuna and swordfish. Who knew that with a very rapid whack to the ‘brainstem,” the catch would immediately become still and be ready for fast preparation on board, long before coming in to the fish market. And the recent catch of “specialty” fish would occupy another quadrant of the Market’s main floor, often destined for Sydney’s varied ethnic restaurants, shops, and customers. 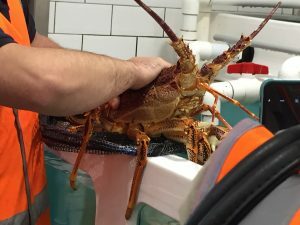 Crustaceans were in abundance and included assorted bivalves such as oysters, clams, and scallops, all positioned in another corner. And amid the cacophony of sounds of workers carting away the purchased delights, for the first few hours of each morning, three enlarged screens with massive running “place your bid” clocks provided the auction details — including weight and quantity, and the important opening bid prices for the bleacher-filled section of brokers vying for various segments of the morning’s catch. What manually took all day for verbal auctioneering in years past — now wrapped up by 8:00 a.m.! How intriguing to learn that a country with such a reasonably small population, could have access to 100s of species of seafood and a daily haul of 1000s of kilos of diversified delicacies. Surprisingly, Branden informed us that the “typical” Aussie still select their three or four “favs,” often including prawns, salmon, and varied options for fish and chips! Did you know that a lively lobster could be soothed by the gentle posterior patting from the head (see below)? 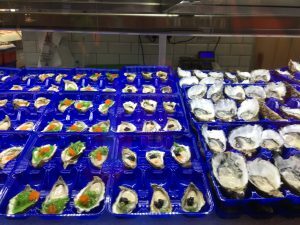 And an expert crew of about six oyster shuckers, spend the day filling trays upon trays of prepped bivalves for local chefs, restaurants, and the retail customers who come to buy. And during our dinners we have sampled salmon, king prawns, trout, blue-eyed cod, whiting, mahi mahi, among other varieties from the sea — nothing quite rivaled the scene we sampled at the Sydney Sea Market. We now travel from the Sydney Harbor and the riches we have experienced so far — it is off to hallowed ground of some of the indigenous peoples who were the first inhabitants of this land of Oz.